I went to Times Square to see the Dog Masquerade Contest. 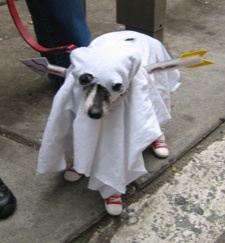 I got there a little late, so there weren’t a lot of dogs there, but the little guy in the ghost costume is the winner! Check out his sneakers. Yay, little guy! Congratulations! 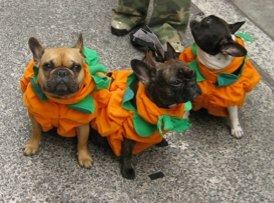 And then there these three little French Bulldogs. The dog on the left is in love with me. The one in the middle is dreaming of his night on Broadway, and the one on the right wants his mommy.